As we know, cable ties are widely used in wire and cable management. What we want to talk about is how to properly select a cable tie for your project, because there are many things that come into play. If you wan to choose the right one. there is a lot of things need to consideration when choosing cable ties. Basically it comes down to three things, tie design, length and strength. There are a lot of different types of cable ties, and each of them are used for a different application. 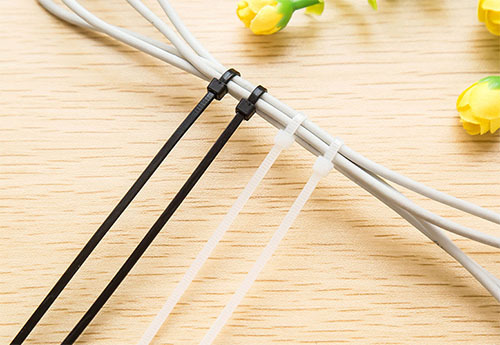 Generally, nylon cable ties is common and be used in everywhere. Also there are some other types, reasuable cable ties, marker cable ties, motor cable ties and metal cable ties etc. Please make sure your cable ties have the right structure for the application. Cable tie length can vary greatly. Think about an application in which you have a wire bundle that is 4” in diameter, but you only have a 1” diameter cable tie. This would not work. You need to match the maximum bundle diameter of the cable tie with the diameter of the wire bundle. Always we choose a longer hundle diameter. Longere is better than shorter. The way we measure cable tie strength is by obtaining its tensile strength. Tensile strength is measured in Newton or pounds and is basically the breaking point of a cable tie. The higher the tensile strength, the stronger the tie. FlexGlory has ties ranging from 18lbs in tensile strength, all the way up to 250lbs. What this means is that it would take over 250lbs of pressure in order to break the latching mechanism on the tie. This is an important factor to consider when you are securing mission critical wire harnesses. Above are the basic factors you need to consider during choose the right cable ties. Furthermore, once you have selected the right cable tie for you and your application, you need to think about the proper way to store them. Please place in cool and dry condition and avoid direct sunray. By carefully evaluating your application, the length and strength of the tie that is needed, you are sure to choose the right tie for the job every time! For more information on FlexGlory cable ties and how to select them, please take a look at our cable tie selection guide.